After moving heaven and earth we have fought off the hordes of invaders that have threatened the sacred lands and the modules of power have been gathered. But seriously its been a long time in getting to you, we are now happy to present new Skyline Update 0.9.7.7. This update has many module editor improvements and loads of new modules to make the visual mechanics system fully usable. We have put the new modules to good use by developing a new powerful FPS System which is not only expandable for Skylines core but easy for you to customise and adapt to your game. So without further ado lets take a tour of some of the new features you have now got in your new update. We have improved the visual modules editor by simplifying the saving of graphs. From now on you only need to hit the save icon in the tool bar and Skyline will save the open graph to the correct location. To save any frustration when changing graphs, which we have encountered many times!. We have added a nag box to pop up if you try to open another graph before the currently edited graph has been saved, giving you the option of saving and/or continuing. There is so much still planned to add to the modules that this is going to be expanding for some time to come. 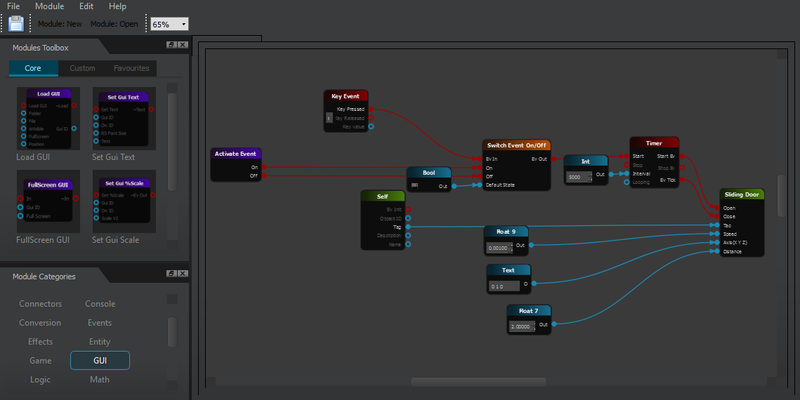 Note that the scene graph save is still direct to file and not the scene so please take care using scene graphs. 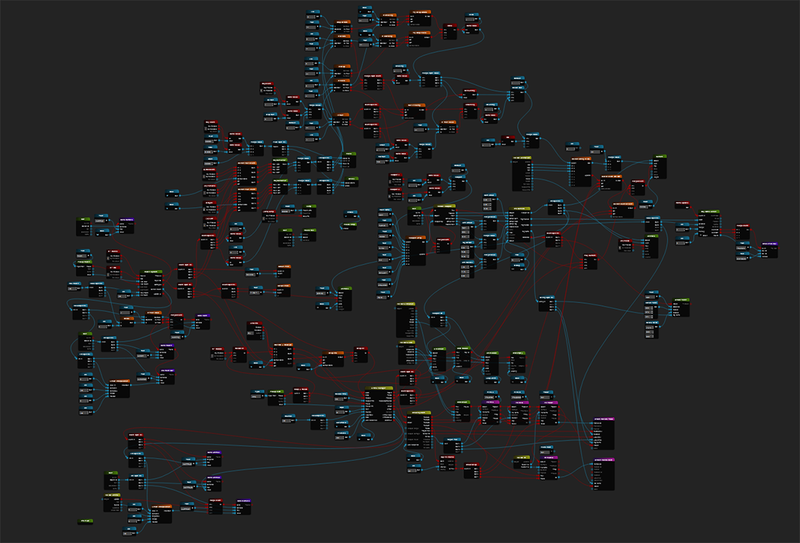 With this said the scene graph is much the same use as the scene script and going to be very important in future games. If you want to try out some graphs to see how everything hooks together, have a look in the asset library/ skygraph/Graphs folder. Here you will find a few graphs covering a few areas. Our aim is to be able to create a complete game through the use of the visual mechanics modules. The first step with this was to replace the current prototype FPS player with a new module based version. This created many challenges in the way modules can communicate with other modules and Skylines core systems. To enable visual mechanics to be able to create a complicated system many new modules have had to be made, somewhere around 40 new modules really open up the system to experimentation. The FPS player has been long overdue some work and this update provides you with a fully customisable FPS player visual module graph in the shape of FPS_SpawnModel preset. 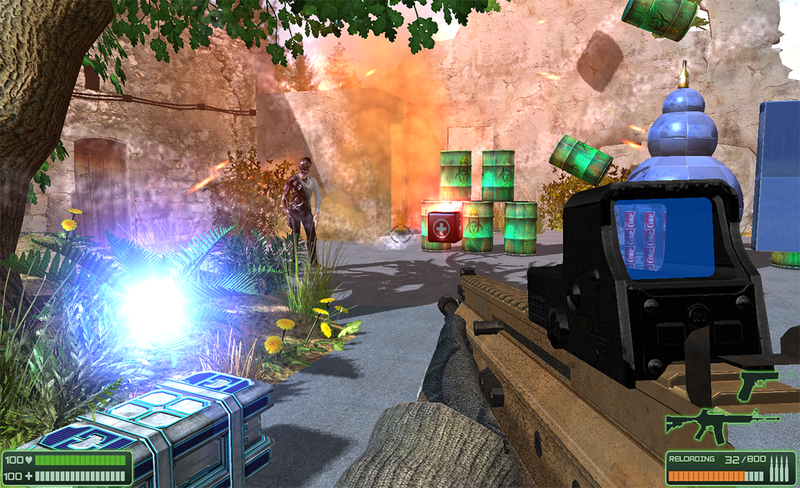 The FPS player has been fully created by using modules and provides a great introduction to the visual mechanics system. We have for your convenience, provided the FPS player graph with the ability to easily add a torch and also the "Activate Item" feature to make it easy interacting with your game world. Note: Check out the new Tech Demos in the Mechanics folder! 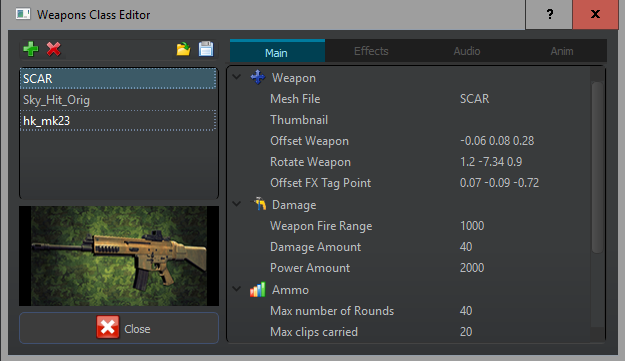 The FPS system now has 2 slots for weapons which can be selected from the updated weapons editor. These weapons remember their own ammo, mags etc and can be changed by pressing Keys  & . We have initially provided an assault rifle and hand gun with more to follow. To top off the new modern looking FPS (Sorry sci-fi fans) we have created a simple new gui hud corresponding with the new fps system features. Oh for interest here is the complete graph for the fps player so far. 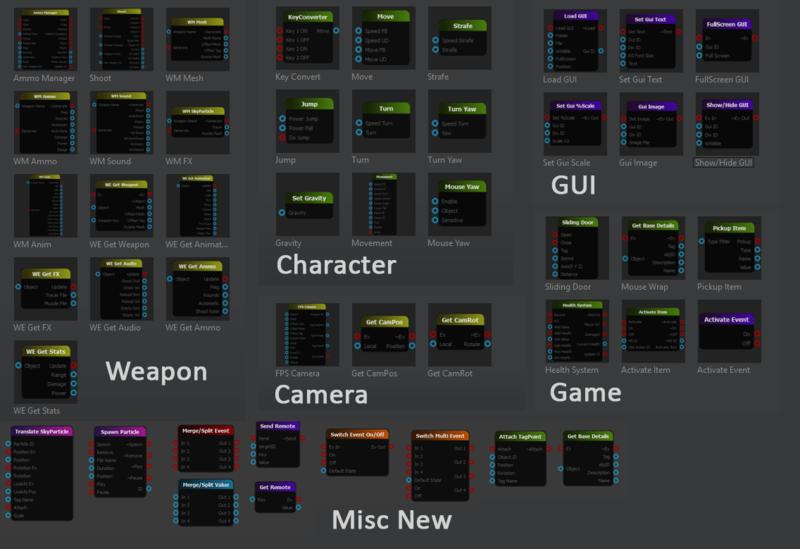 The weapons editor has had an overhaul to bring it into line with the new FPS system. Please note the old FPS weapon will still work with the upgraded editor and the default scene has all 3 weapons available. I am sure you have been in a similar situation as us where you have been lost in your scene only for Skyline to crash before you made any save! 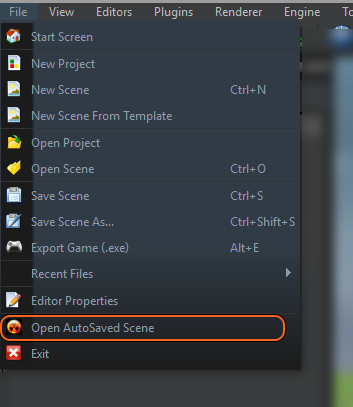 Fear not we have added an auto save feature where Skyline will make a scene save for you every 5 mins. We found that this was frequent enough and did not affect us when working, just a small blip in frame rate for a few seconds. We thought this would be better than losing your scene! When resources are loaded, they are added to gpu ram. We have seen large memory usage when browsing assets or with very large scenes. This can be a problem with low memory gfx cards as memory can run out. When this occurs there is a performance drop and you may have noticed popping and sticky camera. Now Skyline manages memory more efficiently where by you only pay for what is currently being used in the view. Once the asset is not needed its memory is freed for further use on more game coolness.